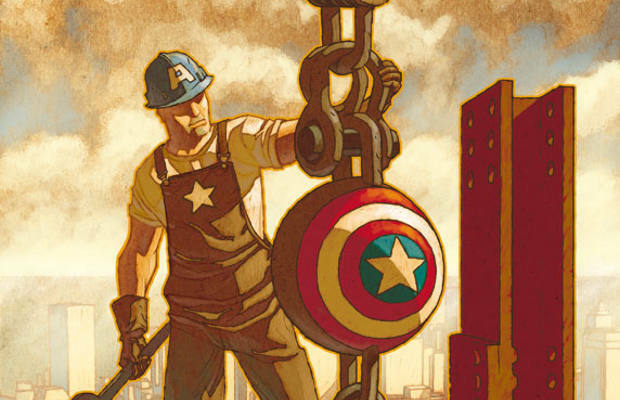 Check Out Marvel's “I Am Captain America” Cover Variants! To drum up anticipation for Captain America: The First Avenger, Marvel Entertainment has started a new initiative called "I Am Captain America." Similar to the recent "Thor Goes Hollywood" program, "I Am Captain America" will be a series of variant covers that run through some of the company’s most high profile books. These covers are inspired by Captain America and feature everyday heroes such as policemen, doctors, and soldiers adorned with Cap’s star and shield logo or parts of his famous costume. After all, do we not all rep the stars and bars in our own way? Featuring some of the comic book industry’s most prominent artists, including Scottie Young, Joe Quesada, David Mack, and Ed McGuiness, the "I Am Captain America" variants will start hitting shelves this June. Look for them in Amazing Spider-Man, Secret Avengers, Astonishing X-Men, and other comics.